Welcome to Doctrines of Christianity! The word “doctrine” comes from the Greek “didacte,” and means “teaching.” This site is dedicated to Christian doctrine. Doctrine is generally broken into three parts: primary doctrine (what someone must believe), secondary doctrine (how the believer is to fulfill what they believe) and tertiary doctrine (other ideas, notions and possibilities presented by Biblical Scripture). 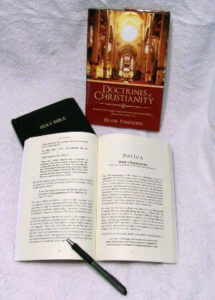 Doctrine provides a Christian or a seeker with the important articles of Christianity. However, this site will engage its readers to understand contemporary issues through national and world political devices, and as well, resolutions, laws and edicts of governments that affect Christianity. This site will follow major personalities, of the world scene, in an effort to help resolve eschatological activities. Though many contemporary and reformed theologians will argue that we are to look for the Coming of Christ, not the Antichrist, the Word of God encourages the Christian to watch for false prophets, false teachers, false apostles, etc., so that the Christian would not be surprised, or found unaware, concerning events that Jesus warned of [Mt.24:42; Mk.13:5, 23, 28, 35; Lk.21:8, 33]. Similarly, the Apostle Paul warns us to take notice in [Ac.20:31; 2 Thes.2:1-4], and as well, the Apostle John reiterates the dangers to come [Rev.1:1-3; 22:18]. It makes rational sense that if Christ and the apostles Paul and John warned us, we then should take heed. They would not have said such things, unless it was to help our faith and allow us to stand firm in times of trouble. We should not to be surprised at the affairs that will take place – to test the hearts of men upon the whole earth.